Luna 12, also called as Lunik is an unmanned space mission in the Luna program. Luna 12 was build to complete the mission of Luna 11. The main aim of the mission is to take high-resolution photos of the Moon’s surface from the lunar orbit. 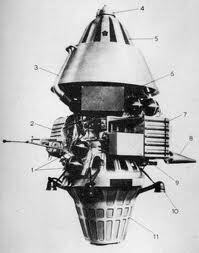 In 1966, 22nd October Luna 12 was 1st launched from the Baikonur Cosmodrome by Molniya rocket into 199 x 212 kilometer orbit around the Earth at 51.9 degrees. It is the first mission is to enter orbit around the Moon. In 1966, 25th October Luna 12 was first launched towards Moon from Earth - orbiting platform and entered a 133 * 1,200 - kilometer orbit. This spacecraft contains Television system and cameras to capture picture of the lunar surface. The photographs contains 1100 scan lines and maximum resolution of picture starts from 14.9-19.8m. In 27th October, Luna 12 sends photograph of Moon’s surface. The First photos of Moon’s captured by the Luna12 were released by Soviet press and the picture that shows the Sea of Rains and the Aristarchus crater. Resolution of the photos was high as 15 -20 meters and film was developed, fixed, dried automatically and scanned images for transmitted to Earth. No further images released to any press or media and images are used for research. After completing the mission, Later Luna 12 are used for scientific mission. In 1967, 19th January, Radio transmission of the Luna 12 was ceased due to Batteries fail after 602 lunar orbits and 320 radio transmissions to Earth.